A good non-slip pad will prevent the rug from moving on the hardwood floor. The floor will be better protected, and it also prevents your rug from bunching up in the middle that can be a tripping hazard. A rug that moves will inevitably have ripples somewhere on it. The rug just feels better with a good pad underneath. Even though the rug under pad we recommend is not very thick, it gives the rug more body, a feeling of stability and a much softer feel. To extend the life of your rug, a good rug under pad is essential. Rugs in high traffic areas will wear out faster for obvious reasons, but the pad will reduce the “hit” of the feet on the rug itself. 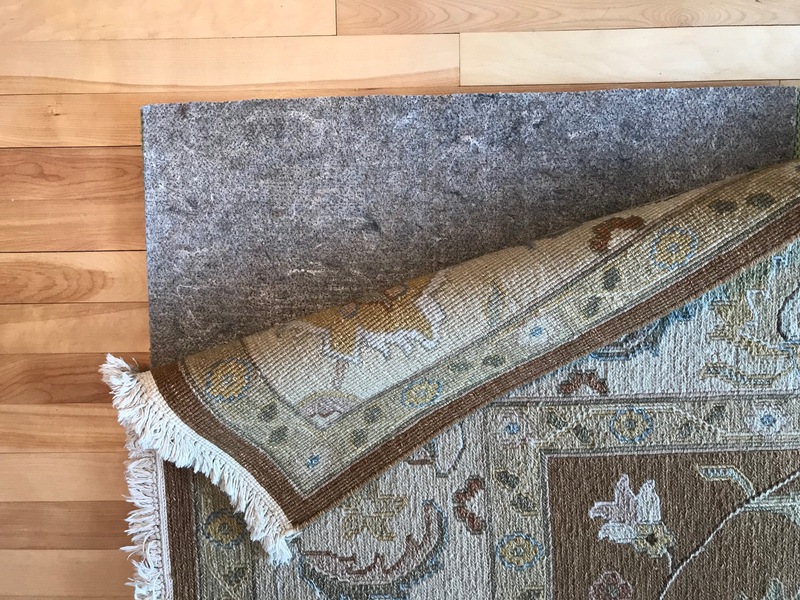 A good rug under pad also gives the edges of the rug protection from developing holes or frays by absorbing some of the impact of foot traffic. Beware of pads that are covered with a layer of latex or chemical spray that can look like a rubber pad. However these layers tend to separate in time, sticking to the floor, even causing damage to the floors finish. Our rug under pad will allow good ventilation during vacuuming and can easily be cleaned with soap and water. Peacock Rug Care sells underpad for area rugs. Please feel free to contact us to ask which product will be best for your specific rug.